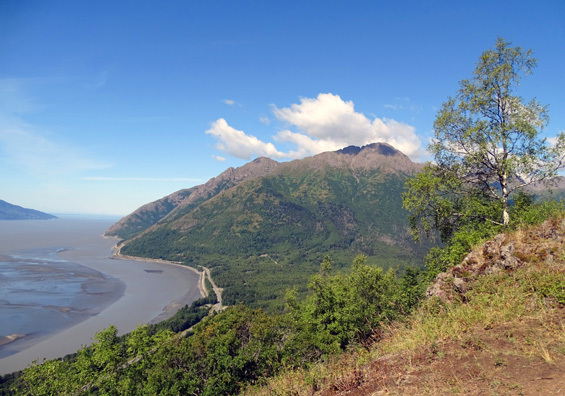 newcomers exploring the mountain's steep slopes overlooking Turnagain Arm. looms near. In all but one case, it decidedly does not." 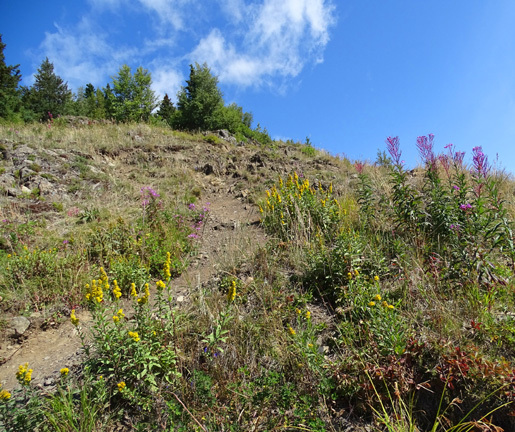 It was Doyle's article and photos that prompted me to add Bird Ridge to my list of new places to hike this summer. 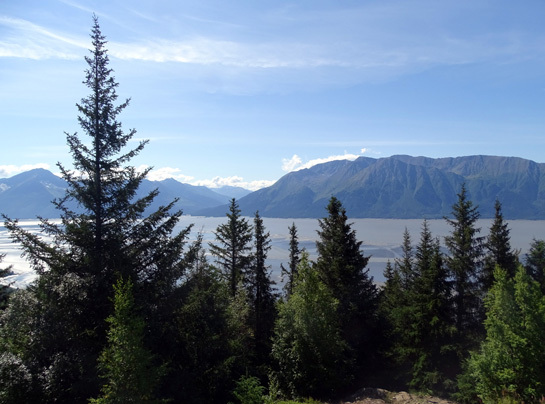 Although I didn't find much about this trail in all the Anchorage and Chugach State Park literature I've collected, there is plenty of information online. to take a picture with so little traffic at 10:30 this morning! 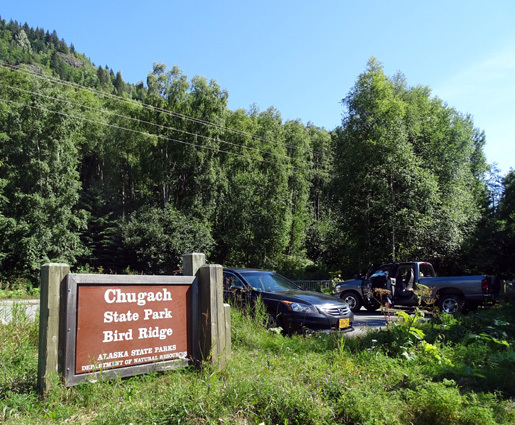 There is room for 20-25 vehicles at the Bird Ridge TH. 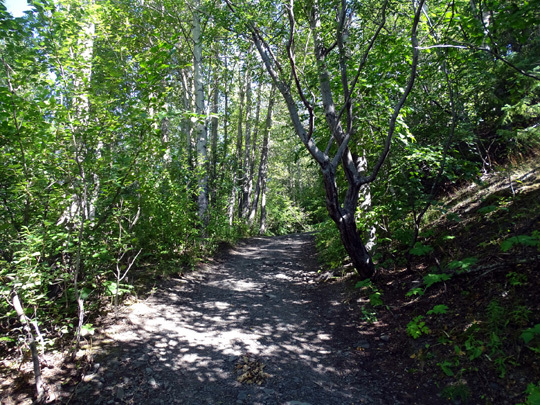 This is the first hike I've done in this part of Chugach State Park. 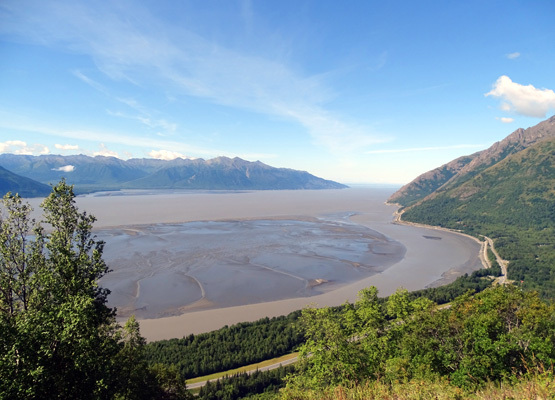 The others have been farther north in the Glen Alps, Eagle River, and Eklutna Lake areas. 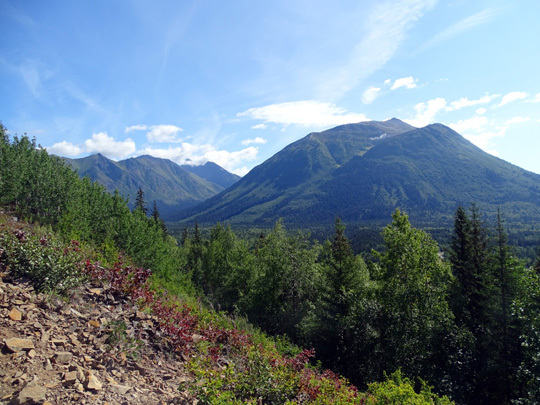 Doyle's detailed description of the trail forewarned me to expect steep grades, loose rocks, and braided trails. 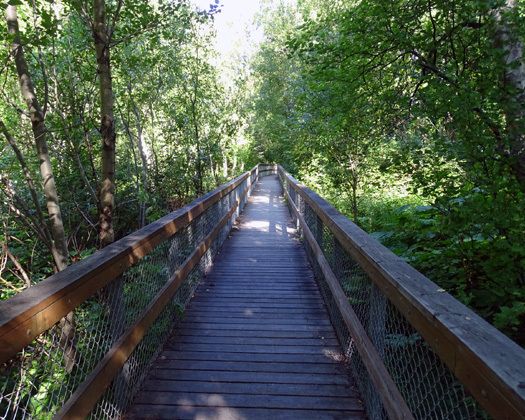 That was helpful to know but it didn't make the trail any easier for me to hike! That's why I took Cody instead of Casey with me. I can hike with him off-leash and worry less about sliding on loose rocks. In spite of that, I did manage a hard fall with no exuberant pup to blame . 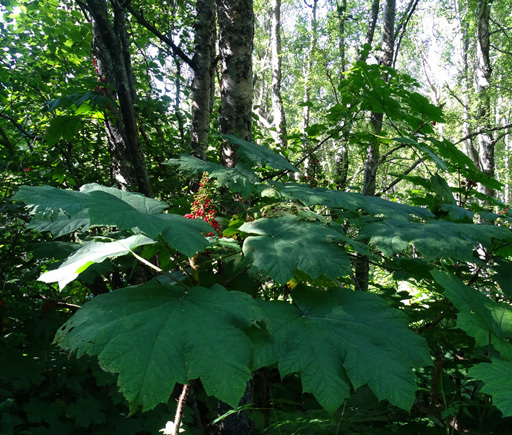 . .
You don't want to brush up against large Devil's Club leaves -- they have very sharp points! 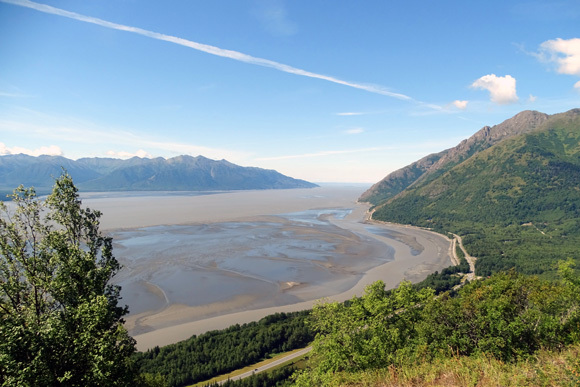 Beyond that, prepare for a wide, then more narrow, dirt and gravel trail with rocks, roots, and a sharp ascent. 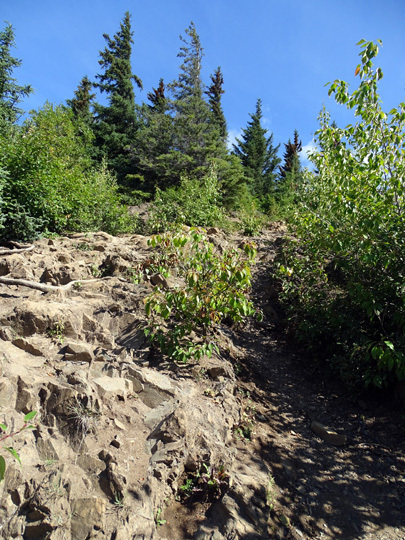 This trail is definitely steep -- about 1,000 feet elevation gain in the first mile, and that was mostly in the three-fourths mile after the initial easy grade on pavement. I climbed for 1.5 miles before turning around and had a gain of 1,800 feet, which is definitely steep in such a short distance. I stopped several times on the way up to let Cody rest and drink water from my pack. He was hot from exertion even in the shade. There was only one creek and he refused to drink from it in either direction. 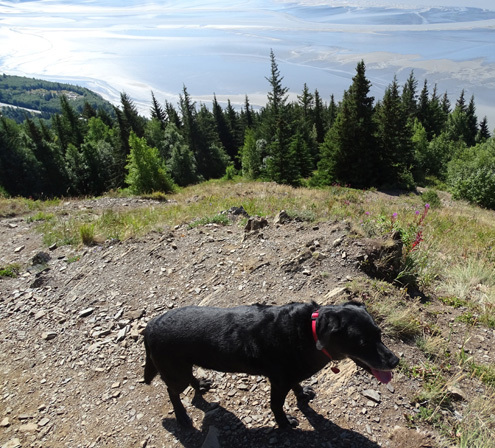 YMMV -- your dog may not be as picky but this can be a hot, dry hike so pack extra water for all two- and four-legged critters in your hiking party. I should have gone earlier in the day when it was cooler for Cody. After an hour we were mostly in the sun so I turned around. I was comfortable because of the strong breeze above most of the trees but Cody-Bear can't take off his thick black fur coat to stay cool in direct sunshine. 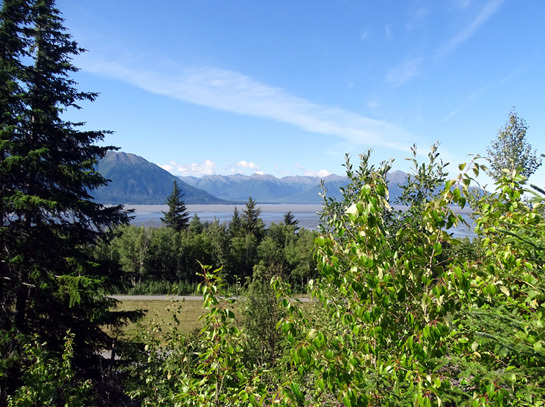 The views were spectacular at all of the overlooks and above the tall trees. 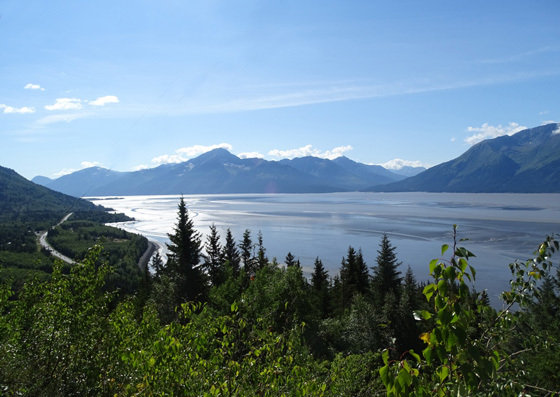 I didn't get totally above all the shrubs but could see Turnagain Arm, the Kenai Mountains, and various Chugach Mtns. to the east and west. 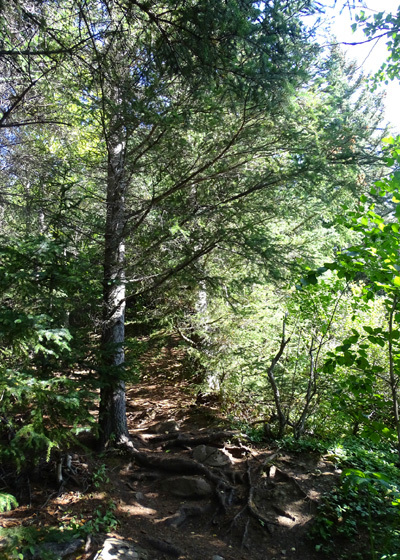 Same direction (east), higher up; you can sort of see how steep the trail is here. 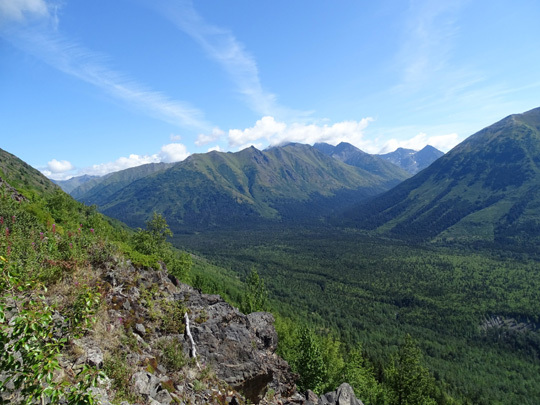 Above and below: I could see farther and farther NE back into the Chugach Range as I climbed higher. Before turning around I could see that the tide was going out, exposing more mud. 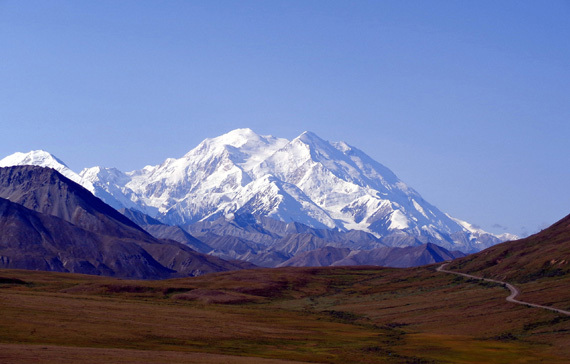 Because of all the false summits I'm not sure how close to the "true" summit I got. It's hard to tell when you're ascending a mountain and can't see the top. 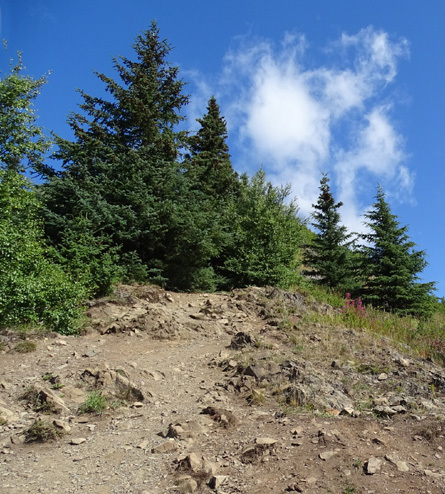 A couple websites I scanned say the summit is at 1� miles but Doyle's article indicates more like 2� miles -- and apparently you can continue along the ridge itself a lot farther than that. OK, buddy, we're on our way back down now. 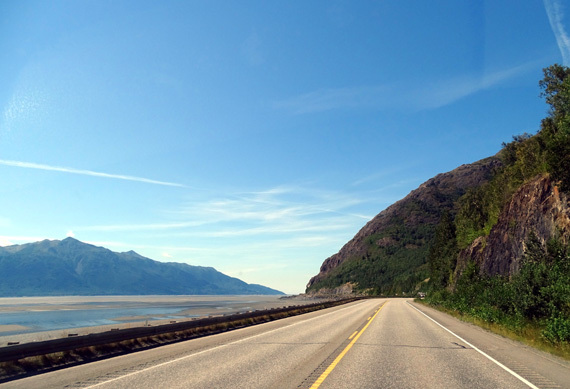 I'm pleased with the fantastic views I got in just 1� miles. I had enough good reasons to stop there so I don't feel like I missed anything by not going any farther. 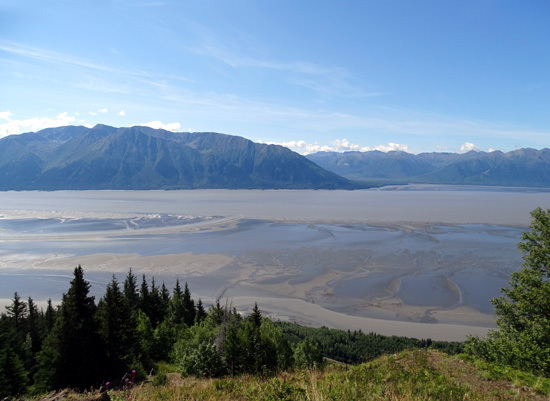 This close-up near the mouth of Turnagain Arm shows lots of mud exposed by early afternoon. I knew the loose rocks would cause problems going down. I did OK till about half a mile from the end when I skidded and fell hard on my left side. It's not the first time and it won't be the last . 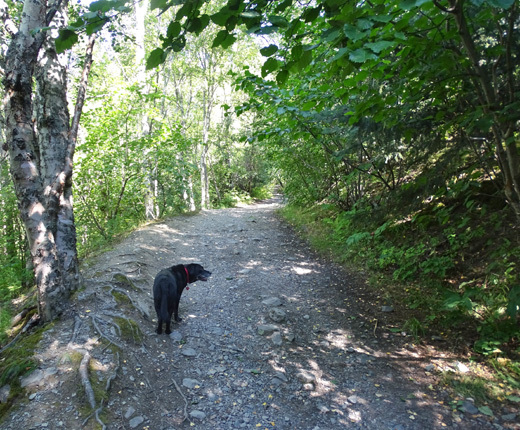 . .
Cody was off-leash the whole way except on the paved part near the parking area. Other dogs were off-leash, too. 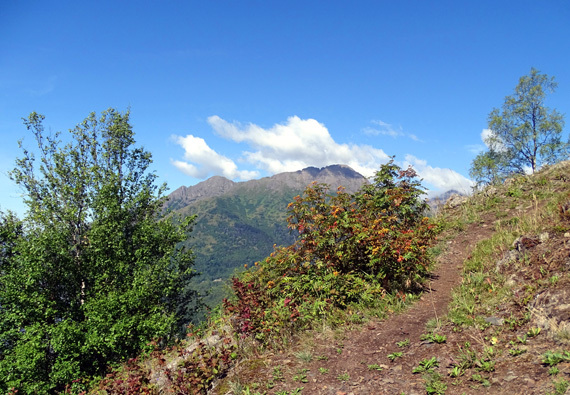 No way I could ever hike down that steep, rough trail with a dog on a leash. 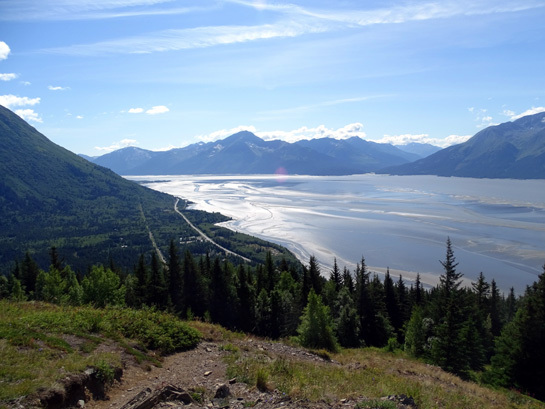 About noon -- still climbing up the mountain -- I could hear lots of sirens down below on the Seward Hwy. I was still in the trees and couldn't see the emergency vehicles but could tell they were heading east. I assumed there was a large wreck somewhere. Yes, indeed. I continued watching the road as I began my descent, wondering if there would be a steady stream after traffic was allowed through again. I'll talk about the wreck in the next entry. 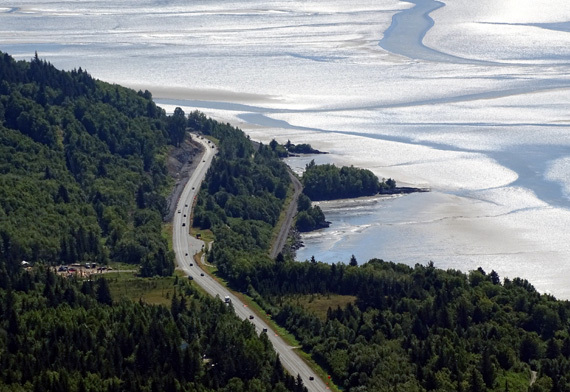 It's a sad tale and a good warning for other visitors who drive on the Seward Hwy. I'm thankful the accident wasn't between Bird Ridge and Anchorage or I would have been unable to get home for many hours. I don't often mention restaurants on this website because we don't eat out much. Occasionally we find such good food or interesting restaurants that I make an exception. This is one of those. 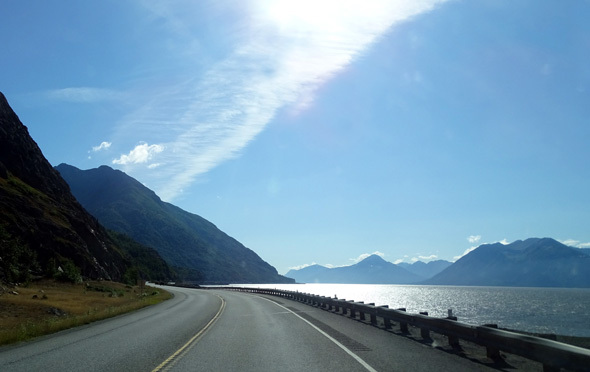 On the way home I took a little detour up the Old Seward Hwy. 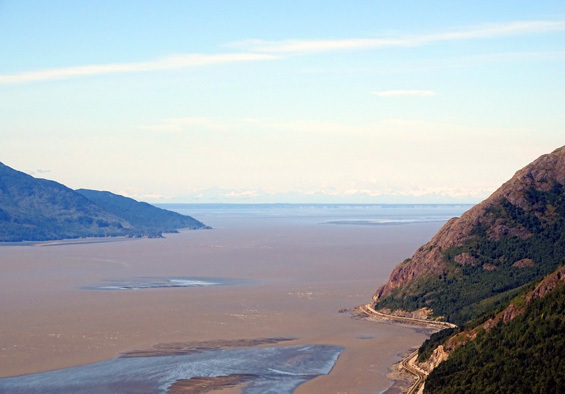 until I found the Moose's Tooth Pub & Pizzeria at the far north end (#3300). It's an upscale pizza parlor and brew pub that's just been voted by Trip Advisor travelers as the third best pizza place in the whole USA (the other two are in NY and FL). Even before this, the restaurant has gained so many customers that it has expanded several times. It averages 3,000 customers a day in the summer! In Anchorage, Alaska, no less!! I was surprised -- I guess I shouldn't have been -- by how many people were there at 3:30 this afternoon. The inside was packed and about 50 people were waiting outside to be seated. When I found out my take-out order would be ready in only 20 minutes, I went ahead and ordered two small pizzas with whole-wheat crusts -- one for Jim, a different kind for me. They were delicious! 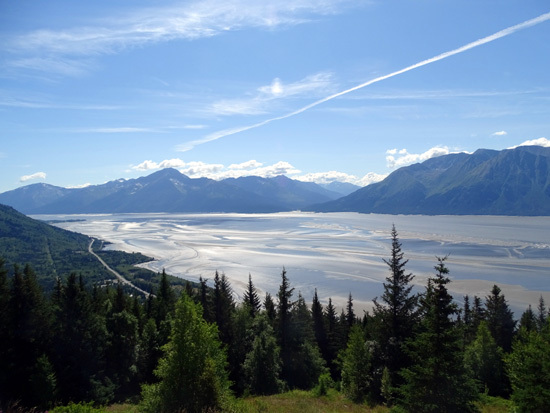 I'd like to go back when we return to Anchorage in a couple weeks, and eat inside the restaurant for the whole "experience."